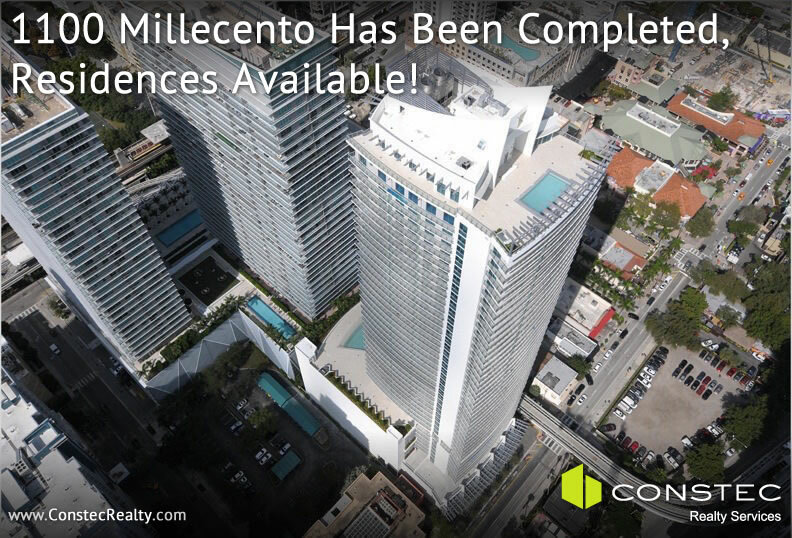 1100 Millicento, the third large post-crash luxury condo tower has been completed in Brickell. Mybrickell and BrickellHouse are the other two. The building received its Temporary Certificate of Occupancy. Residences in 1100 Millecento have reached the resale market are are available. Floor plans include 1 and 2 bedroom layouts, as well as studios and they all adhere to a strict attention to modernism. This building is brand new. Contact us now for assistance in securing one of these modern residences or to assist in the sale of your condo at 1100 Millecento. Right now, there are 28 units in 1100 Millecento available for sale. The available 1100 Millecento residences range in price from $315,000 to $799,000. There is also a large inventory of rentals available from $1,750 to $3,650 / month. At this moment, there are 48 rental options to choose from. 1100 Millecento stands 42 stories tall and is the product of the famous Italian design firm Pininfarina and Carlos Ott. In total there are approximately 382 Brickell condos for sale with views of the city. This building oozes more style than most of the other Miami-area buildings. Some of the amenities include a private screening room with theater style seating, a state-of-the-art fitness center, health spa and more. The Cielo Room is located on the rooftop. This is a “Smart Building” with touch panels that allow residents to request various services. 1100 Millecento is located in Brickell. Mary Brickell Village is close by and has bars, restaurants and shops. Lincoln Road and Ocean Drive are just across Biscayne Bay on the barrier island of Miami Beach. To the southeast is Key Biscayne and its beaches and parks overlooking the water.